Inder Loves Folk Art: Fancy Field Trip PJs. 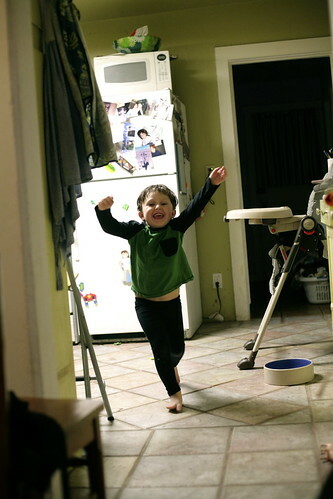 I am finally blogging the Field Trip Raglan t-shirt that I made Joe for KCW a couple weeks back! With Joe, the hardest part of blogging is not sewing him clothing, but getting him to put it on and suffer through a photo shoot. 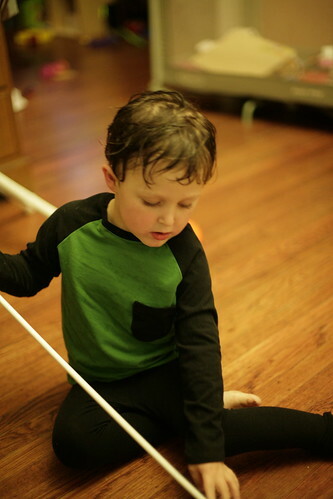 In this case, I made him a matching pair of Fancy Pants PJ pants and put on some dancing music, and proceeded with our nightly ritual of doing a little yoga, running around in circles, dancing, and general horseplay before bed. I have found that this is a good way to burn off steam for Joe and counteract the evening grumpies for us tired parents. Also, I find that spending some time in downward dog every evening helps to stretch out my neck and shoulder muscles, which get stiff after a long day of driving, sitting in front of a computer, nursing Maggie, or carrying kids around. While I hang out in downward dog, the kids run around like crazed animals, crawl under my body, squawk, and generally "shake their sillies out." Initially, I made this combo for Joe to wear under his Snake costume on Halloween. The green knit was leftover from Maggie's Bimaa hoodie, and the black was intended to disappear under the snake. But I didn't finish them in time, so I just grabbed a few dark colored items from Joe's drawer for Halloween and he looked great. But you can never have too many basic long sleeved t-shirts or PJ pants, so here we are! I don't have too much to say about this t-shirt pattern, except that here we have another basic, wonderful pattern from oliver + s! With this pattern and the Flashback Skinny Tee, I am completely covered for basic t-shirts for Joe for, like, forever (however, I do have my eye on some henley and polo style patterns, cough cough ... ). As always, I was impressed by Liesl's instructions for this t-shirt. This would be an ideal first project in knits - the instructions really hold your hand through the process. At this point I consider myself quite the old pro in sewing knits, but it's still really nice to work with such a well-drafted pattern. The Field Trip has a more relaxed fit than the Flashback tee, which I know Joe appreciates; for my part, I love the look of a basic "baseball" raglan (so many colorful options! ), so we're both sold. When I finished this shirt and showed it to Joe, he said emphatically, "I like that shirt." Because, did you know, Joe's favorite colors are "blue and green." He also loves a good pocket, so this shirt is a big winner! I have plans to use this pattern to make Joe a sweatshirt for chilly days at school. I am thinking I could just go up a size in the body, using soft sweatshirt fleece, and add ribbing to the neck, wrists, and hem. Joe hates wearing jackets and even resists cardigans or hoodies, but he is willing to wear a basic crewneck sweatshirt, I think because it feels just like a t-shirt on. 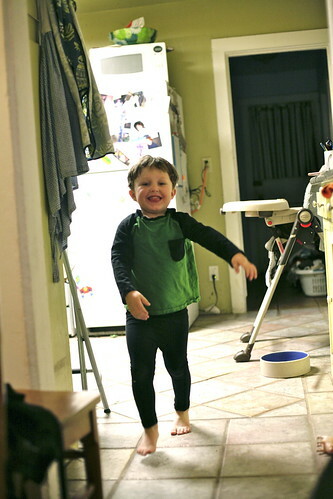 He has strong opinions about what he wears, but I am happy to report that he has been wearing his mama-made pants frequently lately, so he seems to be over that aversion, at least for now. 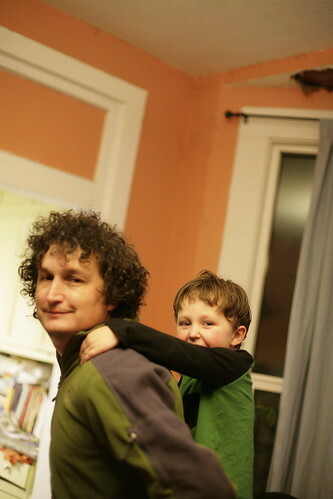 And then he piggybacked on Daddy, who was slithering around like a snake, as he is wont to do. 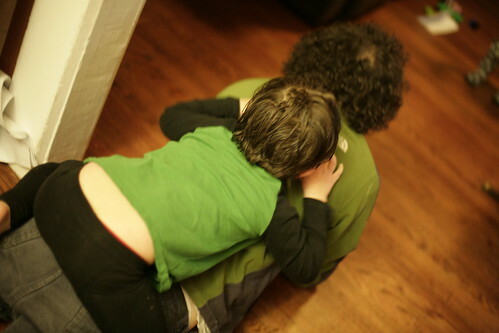 And here he is piggybacking on an upright Daddy, who was pretending he was looking all over for Joe. Where is that kid, anyway? Okay, you have convinced me to make the fancy pants. 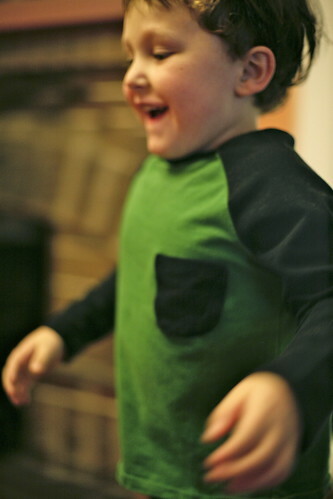 They look so cute on a older boy for pj's. I wasn't sure about them at first after getting them in the fall pattern anthology bundle. Yes! They are great! I especially love that there is no elastic in the waist, making them extra comfy (and easy to sew). One thing I would say though - use a lycra knit with a lot of stretch and great recovery so that they aren't too tight and stay up nicely. 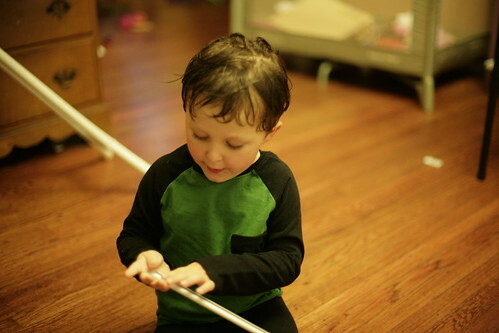 Awesome Pj's and please tell me when Joe got so big?